Whether it’s for home, work, or the outdoors, Baeseman’s Shoes and Clothing has the knowledge and experience to help you step into the perfect footwear suited to your needs. Our footwear products are rugged, dependable, and some, still American-made – and we also specialize in wide widths and large sizes, stocking sizes up to 16. Doctors continuously recommend Baeseman’s Shoes and Clothing to their patients for Lynco orthotics, a removable foot bed designed to determine your foot size, your arch type, and heel-to-toe arch length. We offer a free digital scan of your foot that makes a recommendation of which orthotic would be best for your foot type. It’s available on the spot and for just a fraction of the cost of a doctor’s visit. Baeseman’s is also associated with upscale quality footwear that area doctors routinely recommend for such foot ailments as plantar fasciitis, hammer toes, callouses, neuromas, metatarsalgia, heel spurs, as well as foot-knee-ankle-back pain. We cater to the factory or construction worker, and you’ll find a large selection of safety toe footwear, including steel, composition, and alloy toe caps. Baeseman’s offers a selection of metatarsal guards with both inside and outside foot protection. Our selection includes waterproof, insulated, uninsulated, as well as non-safety toed boots and shoes for both men and women. For the avid outdoorsman, you’ll find a great selection of hiking boots, insulated and uninsulated hunting boots, rubber knee boots, and warm pac boots for both men and women. If you’re an athlete, we offer a selection of tennis and cross training shoes, light hikers, trail runners, water shoes, and sandals. Office workers will appreciate our stock of comfort-oriented dress shoes, casual shoes, static dissipative and sport shoes. For the retired workers (or just tired), we carry a vast selection of house shoes and bedroom slippers. 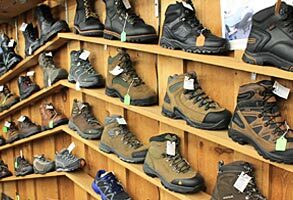 Stop in and take a peek at our large product selection including Red Wing, Irish Setter, Vasque, Rocky, Timberland, Georgia, Catepiller, Carolina, Converse, Reebok, Wolverine, Danner, La Crosse, Bogs, Tingley, Ranger, Servus, Worx, Aetrex, New Balance, Hush Puppies, Born, Propet, Minnetonka, Lamo, Columbia, Skechers, Tender Tootsies, Acorn, and Birkenstock footwear. We also carry footwear care products by KG Boot Guard, Shoe Goo, Nor-V-Gen Oil, Neatsfoot Oil, as well as mink oil, silicone, shoehorns, shoe and bootlaces, heel clips and bootjacks. We look forward to building a lasting relationship through excellent service, selection, and a customer-friendly shopping experience.